Looking for the perfect gift for that pop culture fan on your list? Here are a few suggestions to cover all the bases — movies, music, TV, comedy, fashion and crayons. As big Bill Murray fans and lovers of coloring books, this is one of our favorite items on the list. 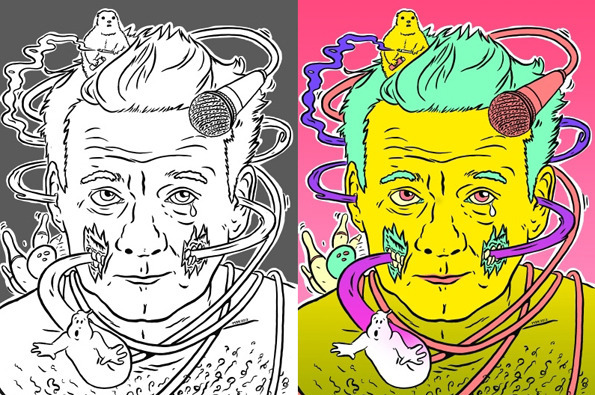 Various artists have created outline drawing of Bill in his various roles from Groundhog Day to Ghostbusters to Lost in Translation. There are 24 pages just ready for your crayola magic. Yoko Ono's clothing collection by Opening Ceremony may not be for everyone but for a Beatles fan it might just be the unusual gift you're looking for. The handprint embellished crotches, see through rear panels, LED bandeau bras, school bell accessories and open-toed thigh-high boots certainly reflect John's sense of humor. The best of TV in one amazing collection. You can buy it in four configurations from a single "Best of" DVD to a complete 22-disc set featuring 50 episodes, bonus aerials, a collector's edition box and cool box that opens by lifting up the curtain. Check in with Mrs. Whiggins, "Went with the Wind," Mama's family and so much more. Here's a nostalgia trip fr you this holiday season. Six decades of MAD magazine — Spy vs. Spy, Mad Fold-In, Horrifying Cliches, the Shadow Knows — all wrapped up in one 256 page edition. The history of MAD, reprints of old articles and lots of Alfred E. Neuman. Stephen Colbert fans need something to do with there money now that the election is over and they can't contribute to his Super PAC. Colbert writes, "As perfect as America is in every single way, America is broken! And we can't exchange it because we're 236 years past the 30-day return window." Colbert shines his infinite wisdom on his readers and the nation to help us all get back on track.